Bishop Mario Alberto Avilés, auxiliary bishop of the Diocese of Brownsville, conducts the mass while carring the cross as worshipers walk the Sarions of the Cross, at the Basilica of the National Shrine of Our Lady of San Juan del Valle Friday, March 30, 2018, in San Juan. SAN JUAN — Thousands of Catholics poured onto the grounds of the Basilica of the National Shrine of Our Lady of San Juan del Valle to mark Good Friday in preparation for Easter Sunday. The large mass, which spilled from the pebbled walkway into the grassy field, walked about a mile, stopping at each one of the 12 stations of the cross to sing somber hymns and pray. 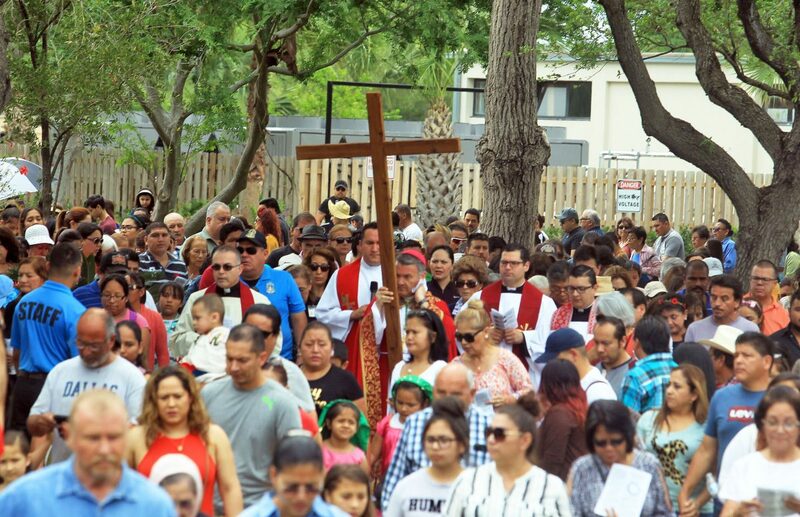 “This is like the top of the mountain we’ve been climbing over the lenten season, and over three days, we get to the top and we get to see the resurrection of our Lord,” said Bishop Mario Aviles, auxiliary bishop of the Diocese of Brownsville. Catholics observe Good Friday in remembrance of the death of their messiah, Jesus Christ, who they believe resurrected from the dead after being crucified. 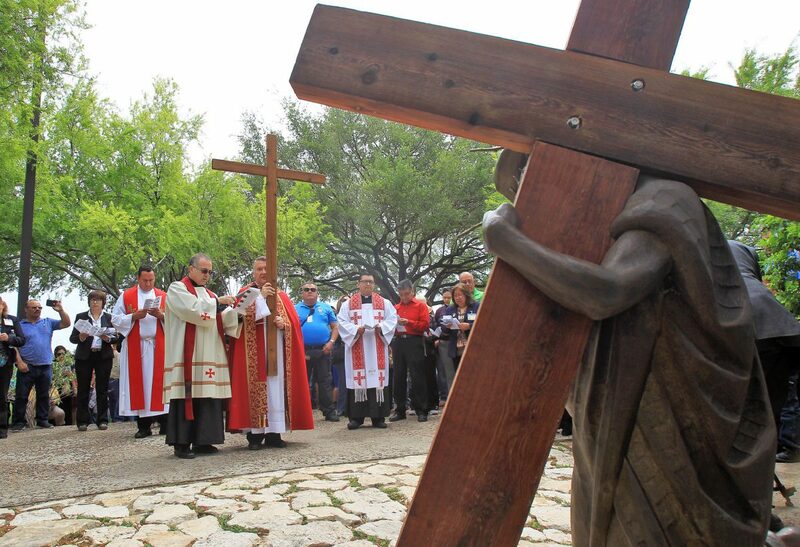 Thousands of men, women and children of all ages followed Aviles through the stations of the cross, which are depicted on the church grounds by bronze statues. Many of Friday’s visitors came from far to mark the occasion, including Aida Flores and her son, 22-year-old Alejandro Flores. They traveled from Three Rivers and George West with Aida’s cousin Irma Esquivel, to mark the occasion. Aviles asked those in attendance to reflect on Jesus’ sacrifice and apply to people in their lives. Flor Arnold, a parishioner of Sacred Heart Church in McAllen, said she had never attended the event, but was glad she finally had the opportunity to do so when her friend invited her. For 11-year-old Justin Esguerra, the walk was a familiar one. 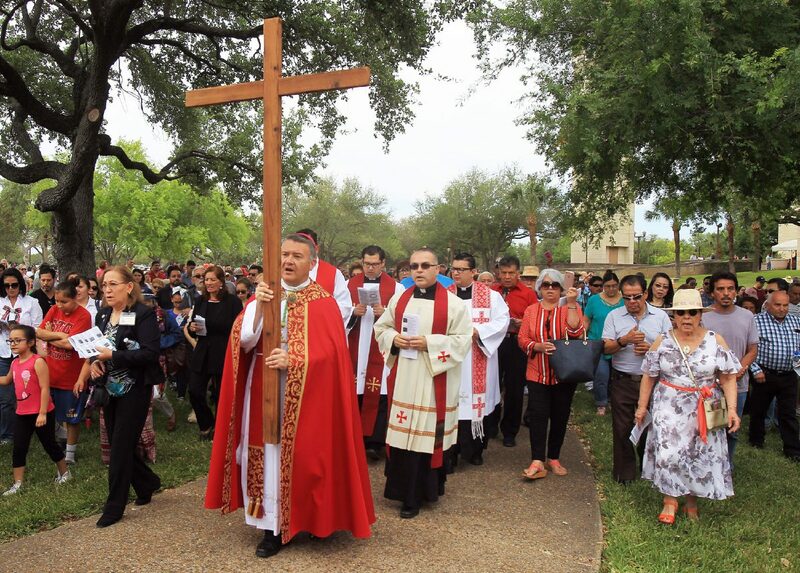 He’s observed Good Friday for most of his life and in Catholic school at Our Lady of Sorrows in McAllen, where students also marked the event. “This is just like a continuation of everything,” his aunt Annabel Castillo said. The Basilica will host a vigil Saturday at 8 p.m., followed by an Easter celebration at Mass on Sunday.